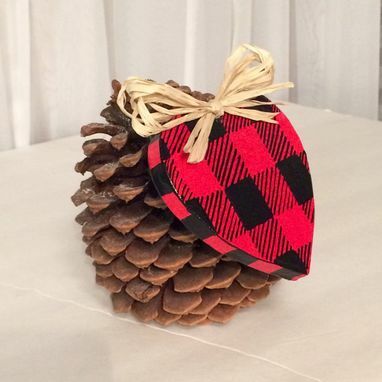 Festive, woodland, blanket check plaid, hand-painted ornament. Everywhere I go these days, I see plaid, plaid, plaid! 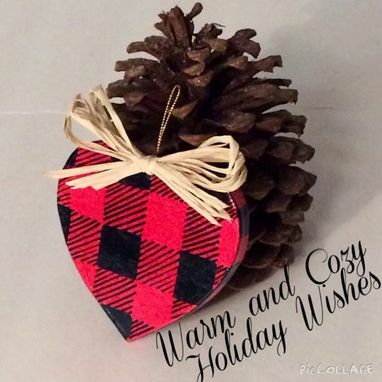 I've been painting plaid details for years, but the pattern that always catches my eye, and makes me feel so cozy, is the traditional red and black buffalo check plaid. Woodland style decorations are all over holiday trees this year (fashion and home decor too). So I just HAD to paint some ornaments that would capture the essence of a snowy night, a cozy fire, a blanket and a good book. These heart shaped ornaments are hand painted, sealed, embellished with a raffia bow, some crystal bling and a wonderful sentiment on the back. 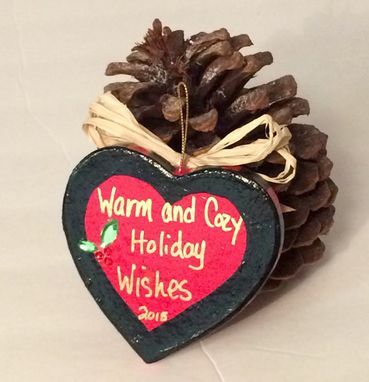 It reads "Warm and Cozy Holiday Wishes" with the date. Any sentiment can be added of course, but this was the one I felt best suits the style don't you? So pretty on its own. Even better sprinkled all over an entire tree! Affordable and gorgeous. Each ornament is 3.5" x 3.75"